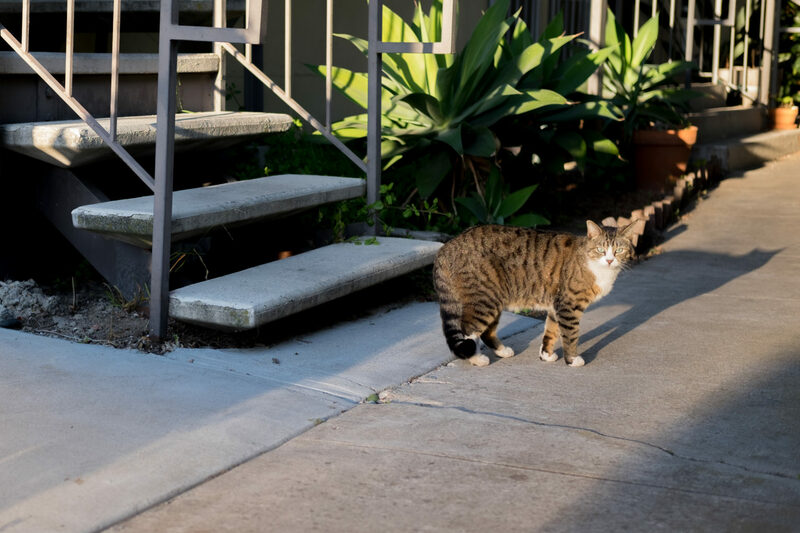 On the evening of March 24, 2016, I set out on a Cat Walk, carrying along Fujifilm X-T1 and Fujinon XF35mmF2 R WR lens. I spotted several felines along North Ave., including this one that gets my nickname Looker—although Poser might be more appropriate. I processed the Featured Image, shot at 6:21 p.m. PDT, from the RAW in Adobe Photoshop Lightroom, cropping and reducing blacks, highlights, and shadows to better emphasize the furball. Vitals: f/2, ISO 200, 1/450 sec, 35mm. Other cats featured in this series: Scruffy, Roly Poly, Woo, Skull, Biscuit, The Colonel, White, Chipper, Frisky, Stretch, Needy, Farfisa, Mates, Hunter, Pee-Pee, Blue, Blue Too, Bonded Pair, Patience, Fess, Jumper, and Frenemy. It’s election day! Please, get out and vote!